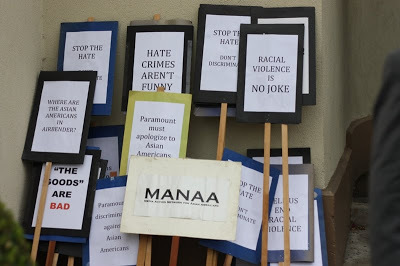 MANAA and other Asian American activist groups will be protesting the film ‘The Goods’ FRIDAY, AUGUST 21, at Paramount. From 4:30 to 6pm, Friday Aug 21 Paramount Studios 5555 Melrose Ave. Los Angeles, CA We believe that the film condones the beating of Asian Americans and makes light of hate crimes. Visit http://manaa.blogspot.com for more info. Los Angeles — A scene from Jeremy Piven’s new comedy “The Goods” has incensed Asian Americans, who find the beating of Ken Jeong’s character frighteningly reminiscent of real violence perpetrated against Asian Americans. “MANAA contacted Paramount to request a chance to screen the film. We tried to give them the benefit of the doubt that seeing the whole movie could somehow salvage this scene. But we received no response,” said Phil Lee, President of the Media Action Network for Asian Americans. The scene in question, which has been widely promoted in trailers, begins with Jeremy Piven riling up his car sales team by saying, “Don’t even get me started on Pearl Harbor — we are the Americans, and they are the enemy. Never again!” The other workers start shouting “Never again!” as the single Asian American, played by Jeong, joins in but looks nervous.Then the crowd turns on him and begins a violent assault that visibly injures him. Piven’s character also uses the racial slur “Japs” — an insult that goes doubly unpunished since Jeong later tells everyone he is Korean, as if the attack would be acceptable if only he were really Japanese. While the scene is played for comedy, the threat of physical violence against Asian Americans is all too real. December 7, the day of the attacks on Pearl Harbor, is commonly dreaded by members of the Japanese American community and the wider Asian American community. Many Asian Americans have been subject to slurs and verbal assaults on this day, and there is a widespread fear that individuals who still harbor anger against the Japanese will erupt in physical violence. The scene showing the beating of Ken Jeong by auto workers is also painfully evocative of the killing of Vincent Chin in 1982. Chin was a 27-year old Chinese auto worker in Michigan who happened to be at the same bar as two white auto workers who felt that the Japanese were to blame for the loss of their jobs. They beat him with a baseball bat, and he died from the injuries. The scene in the movie similarly confuses Japanese individuals from Japan with all individuals of Asian descent. Even so, this does not justify retributive violence for an event that occurred during a war nearly 70 years ago. 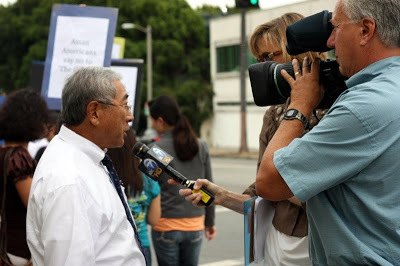 MANAA is the only organization solely dedicated to monitoring the media and its depiction and coverage of Asian Americans. 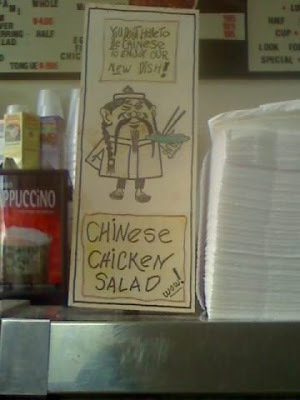 A recent Chinese American visitor to Label’s Delicatessen in West Los Angeles was horrified to find a racist caricature advertising their chinese chicken salad, with the phrase “You don’t have to be Chinese to enjoy our new dish.” He left the restaurant and called owner/manager Bruce Krakoff to ask that the sign be removed, but Krakoff stated that he was free to do whatever he liked in his store and would not remove the sign, which he also claimed that his customers loved. This is unfortunate, because the caricature is evocative of anti-Chinese discrimination and violence from the turn of the century, when the image of the “coolie” represented an oppressed lower class that was systemically excluded from citizenship and civil rights in the United States because they were seen as alien. Given this history, it is by no means a harmless cartoon, and should not be used in this context. Since then, the Anti-Defamation League and OCA have both sent letters to Krakoff, and as far as we know this sign can still be seen in the deli. The original complainant says that this is not the picture he saw, which was much more offensive, suggesting that there are multiple versions of the chicken salad advertisement. MANAA would like to add their voice to the mix by requesting not only that all advertisements with racist caricatures be removed from the store, but also that Krakoff issue an apology to his customers. INCIDENT UPDATE: After their first press release, Adidas continued to receive negative response and pressure from those who found the shoe caricature offensive. On April 26, 2006, Adidas released another announcement that it would pull the remaining shoes from the marketplace. 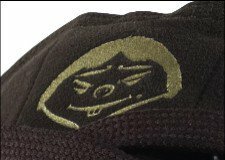 At the March general meeting, MANAA members discussed the controversy over a new Adidas sneaker with a caricature of a buck toothed, slant-eyed Asian. The image is reminiscent of those used in late 1800s and WWII to spread anti-Asian American sentiment. MANAA needs your help to call and write CBS Radio and urge the company to severely discipline syndicated radio host Adam Carolla for his most recent offensive comments against the Asian American community.